You're watching a chapter from "Cut to Black," a roundtable discussion about the ending of The Sopranos and the show's effect on the development of TV drama. Participants include RogerEbert.com editor and New York Magazine TV critic Matt Zoller Seitz, Huffington Post TV critic Maureen Ryan, A.V. Club TV critic Ryan McGee, and previously.tv contributor Sarah D. Bunting. The series was shot and edited by Dave Bunting, Jr.
Chapter 2 is about whether Tony got whacked, and why we're so obsessed with knowing the answer. MZS: Well, we also have the "unidentified black males" that he looks at. Bunting: And a guy in a USA trucker's hat. And a little Cub Scout pack. Did a Webelo sneak up and garrote him?! Ryan: It could be anything. McGee: There is a patch for that, the Whack the Mob Boss patch that you get. Bunting: Like, a little patron saint with blood drops on it? Bunting: I'm open to the possibility, if Chase says that this is what happens. That wasn't my read, but I accept it. MZS: The scenario you described is also another way of reading the ending, which is that Tony's punishment is to be Tony. And part of being Tony is knowing that at any moment, somebody could kill you, or kill your family. Bunting: Or they're just waiting for a process server. Everybody forgets this last plot point: Neil Mink, with his ketchup bottle...that the blood won't come out, if you want to go there. MZS: Yeah, I loved that. To me, that was a laugh moment. That's The Sopranos in a nutshell: you're sitting there, trying to get the ketchup to come out of the bottle, but it won't come out of the bottle. Because it's The Sopranos! They're not going to let the ketchup come out of the bottle. McGee: That's what I love about the ending, the fact that it's so ambiguous. That's why we're still talking about it so many years later. How disinteresting would it have been if we knew definitively how the show actually ended? You say that you wrote, "David Chase whacked the viewer." He's also whacking expectations, and that's pervasive throughout the entire show: building something up, and actually having it deflate before it can actually arise. MZS: Well, look at how he handled the Richie Aprile plotline in season two. Same kind of thing: we're sitting there, expecting that Tony and Richie will come to blows, or something, and Richie will die. Richie will die at the hands of Tony, or the hands of one of Tony's people. And in fact it's Janice that kills him. And it doesn't even happen at the end of the season. It's so shocking because you just don't expect it. There's about five or six different ways in which you don't expect it. And it feels like an anti-climax, and, actually, when it first happened, I was kind of annoyed. I was kind of annoyed because it reminded me of one of those action films that are very promiscuous in how many of the major characters that they kill, just to show you that no one is safe. But it seems [like] the appropriate ending for that plotline, and that's a Sopranos way to end it. It seems very logical. MZS: He is the main character. McGee: He is the main character, so there are sympathies. MZS: We see his dreams. If you see a character's dreams, he's the main character. McGee: He's the main character. So the desire for bloodshed in the end was maybe something he was consciously trying to avoid, or make a comment on with that cut. It's possible. 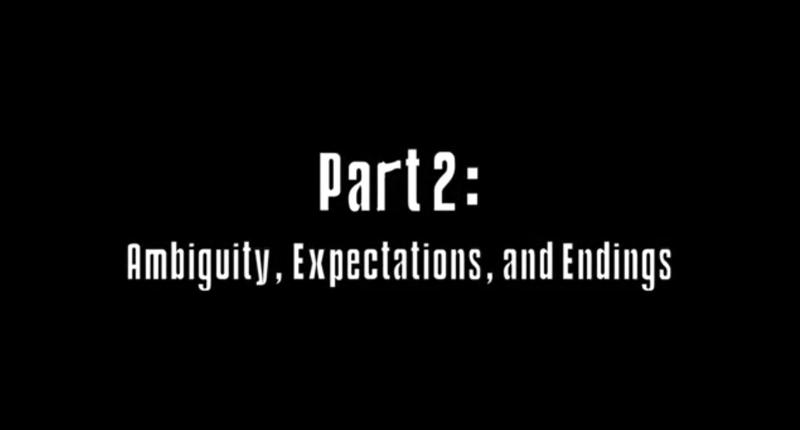 But again, all these expectations were almost external to the show, if you look at the show in a nutshell. Something like the ending of Lost, you don't hear Damon Lindelof and Carlton Cuse talk about the ending of the show for three years: are you disappointed by the ending of season six? How are people going to feel about this down the line? I'll be very curious when people who see the end of the show, after having seen Lost, Breaking Bad, Mad Men...how they react to The Sopranos. And then go back, through the prism of all that, to The Sopranos. Are they gonna have the same reaction? MZS: I don't think that they can. The opposite extreme is the way that Cheers ended, which is: one by one, all the characters leave the bar, and it ends with Sam turning the lights out. The Sopranos was a perfect ending for that show, particularly given that, I think, David Chase grew increasingly conflicted with his relationship with Tony as the years went on. I think it was pretty black-and-white for him in early seasons, but as it became this cultural Godzilla, and he's adding on seasons that I -- and I could be wrong about this -- in his dream conception of the show, it wasn't, whatever, six-and-a-half seasons. And by the time it got to that point, he had all these expectations on him. I think that's the only ending that he, personally, as the creator of the series' leader, could do. So with The Sopranos though, I have to say...I can understand that choice on an intellectual level. And I just have to say, emotionally, I wasn't not satisfied. It does feel like an evasion, and it does feel like ripping the scab off, when I would have much rather you have given me a little pat on the arm and said, 'Now I'm going to rip the scab off.' I didn't get that. MZS: Not very Chase-like though. Bunting: But that's what series finale's are for, to wrap things up. Ryan: That kind of thing...it was too tidy for Friday Night Lights. I really cared about those people. So I get it intellectually, and as a piece of aesthetic filmmaking, I can understand it. But I did want something different. But it's his right to make his show, and make his statement about what he thought were our experiences of that show, and how it should end.